5 more New Reviews for those of the underground!!!! There are moments when you hear an album and you just know what your going to get and how your going to respond to said style and genre. Ares Kingdom are just that kind of band mix of Extreme Thrash and Old School Death metal in the most moshing and catchy of manners. 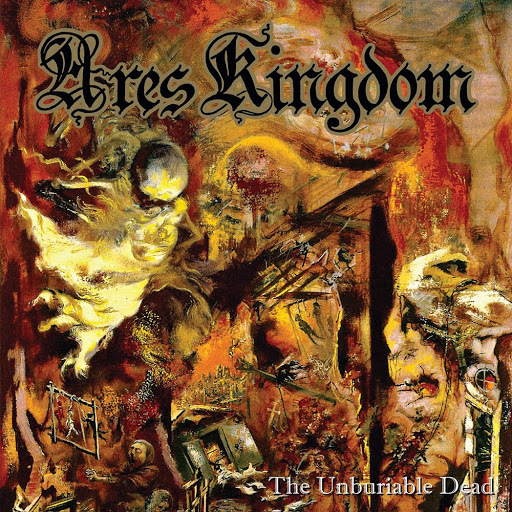 I know some throw in Black metal elements for good measures but what I hear from Ares Kingdom is very clearly mixing sounds of Coroner, Kreator, Nuclear Assault, Napalm Death, Dismember, Brutality, Bolt Thrower and Carcass all for good measure. The melodic moments with the gripping torn throat vocal style works so well with that 90's Melodic Death metal sound that comes shining through. All I can say is we need more Ares Kingdom in the world as this is the kind of metal that is best played live and to get the next generation going to keep this music thriving and growing past the 21st century !!! Total over the top Prog metal and you know what it's breathe taking in all is wonder and power that is being presented here. I really shocked this is not coming from Laser Edge or Inside out just the 1st track. So where this band comes from is sounds like Mastodon, Pelican, Mouth of the Architect, Burst, Devin Townsend and Cave in to just begin a strong ideal of what we have going on there. The organs mix with complex dark guitar and bass lines and a lazy off timed almost jazzy drumming in the metal realm . Nothing is Pedestrian or straight forward about this band and that is what makes me love the album all the more . There is this amazing groove and harmony going on through the entire release as well that is infectious in a very major way. The screamo meets melodic sung vocals work as such an amazing dynamic too. I'm not where else I can stroke this bands ego as we have a stellar release here. Remember those dirty rock records that were a mix of Blues, hard rock and arena rock? You know Junkyard, Circle of Power, Jackyl, KIX, Faster Pussycat and Bullet boys.. Well welcome back to those days all over again that 80's / 90's hey day is back in full force with this band and they are damn good at it. These songs have the soul and groove that makes you want to listen to it over and over again . this that NYC heavy rock meet LA Dirty Glam side. They sound so much like Junkyard and Circle of Power at times it's just amazing. You can tell they have been honing their skills for awhile as you don't just make a record like this . You live a lifetime of it and it just comes from you like kick to the teeth. If you like this style of music you can not pass on it as you will be missing out on something very special . So the style I'm about to say I hear from this band should not be as it seems to be elements that should not mix in any way shape of form but does???? Epic Prog Sludge Fuzzed out retro metal.. If Arcturus, Voivod , Cathedral, Solace and Trouble could be influenced by Pink Floyd and Early Genesis you very closely have Void of Sleep. I still don't see how this can work but it does and it one of the most impressive of way. There is so much going on here I don't know where to turn. This band is really all over the map. Another band I must put under the the title of " THINKING MAN'S METAL" but should I be shock as its under Aural music which houses label like Code666 and Eibon in it's ranks. Just sit back and enjoy the ride that all I can really say..